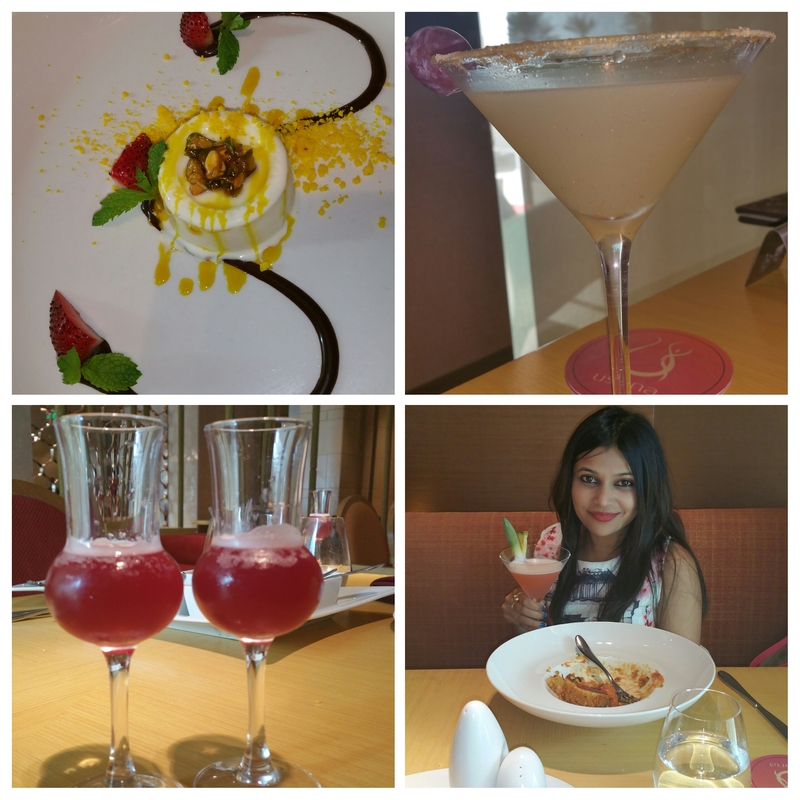 While waiting for the starters Basanta recommended their award winning drink: Delhi 6 made from Tequila, Grapes, Sour Mix and Chaat Masala to give it the Delhi twist. It truly is my new favourite and I ordered for one more 🙂 I also loved the drink Medhya made from Tanqueray No.10 Gin, Pomegranate, Pineapple and Sour Mix. Both drinks were surprisingly very good. For Mocktails, you should try the refreshing Ayur made from Basil, PassionFruit, Sour Mix & Grenadine. We started our meal with scrumptious appetizers Dahi Kebab with Strawberry Makhani (Panko-crumbed spiced yoghurt dumplings, deep-fried and served with strawberry infused makhani sauce), Tandoori Apple, Bocconcini & Rocca Salad (Chilled salad of apple wedges cooked with classic tandoori ‘laal masala’, bocconcini and rocket lettuce; dressing of blended apple peel, honey and star anise), Bharwan Aloo, Tomato Khichdi(Crispy potato barrels stuffed with a spiced mixture of cottage cheese, vegetables and dry fruits, served on tomato flavoured Punjabi khichdi). All of this is vegetarian yes. My husband loved the Salmon Tikka, Squid & Green Pea Khichdi (Dill flavoured Salmon tikka smoked in the tandoor; served on squid & green masala khichdi with petit pois), Dhuyein ka Broccoli & Mushroom (Creamy mushroom and broccoli florets, charred in the tandoor and served with orange and pear flavored smoke), Jumbo Shrimp, Biryani in Phyllo (Classic ajwain flavoured tandoori shrimps, served with shrimp flavoured biryani rice baked in phyllo pastry). He enjoyed all these starters scrupulously. 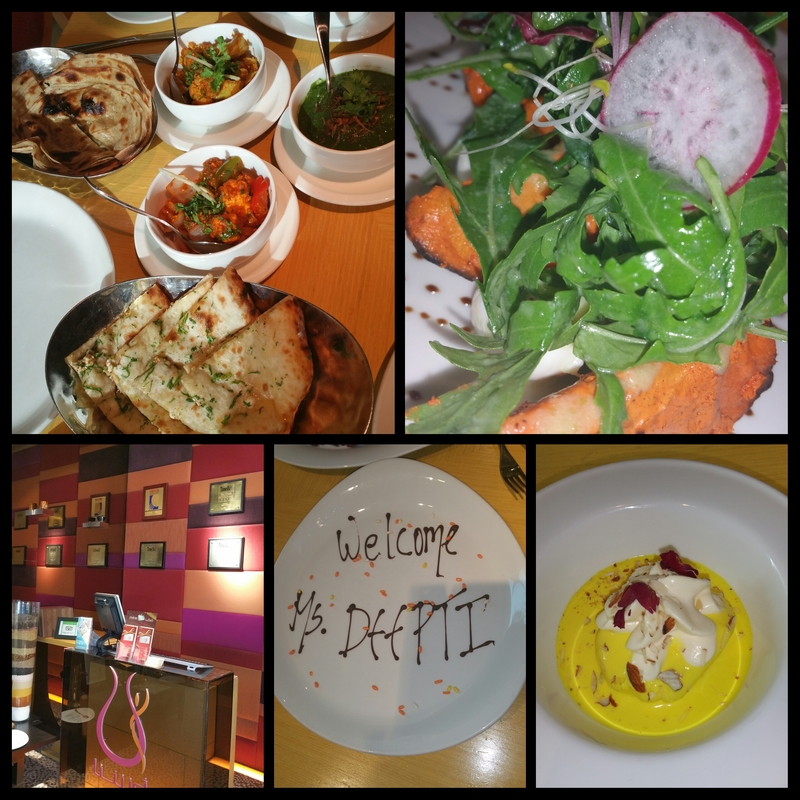 We hardly had space for main course still couldn’t stop ourselves from trying the Kadhai Paneer , Dal Makhani with some Naan and Panner Paratha for main course. Keep some space for dessert and try the yummy Malai Pista Kulfi and Rasmalai. 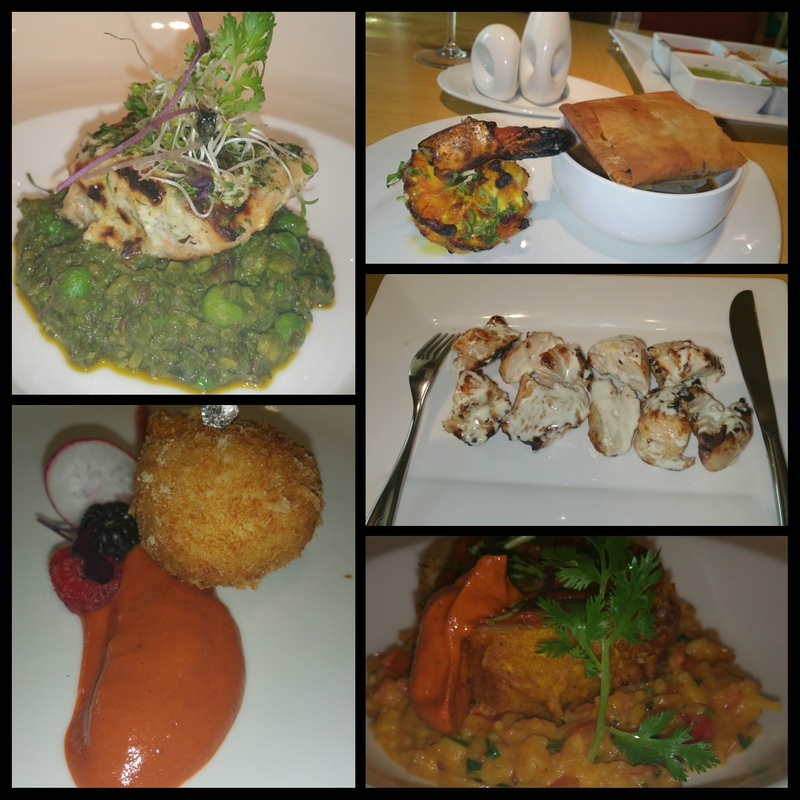 Ushna is recommended for Indian cuisine as it meets five star restaurant standards, ambience, food & amazing service. I noticed many Arabs and Europeans dining at Ushna as the taste suits all nationalities. Lunch for two will cost AED 300 to 350 without drinks. For a family of 4 it will cost AED 500 to 550 without drinks.